WASHINGTON (CNN) -- As a candidate, Barack Obama promoted hybrid cars. 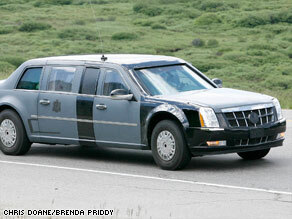 Auto enthusiasts have panned the design of the new presidential limo, which will be painted all black. As president, he'll be handed the keys to one. Sort of. Shortly after taking the oath of office, Obama will climb into the Mother of All Hybrids -- part car, part truck and, from the looks of it, part tank. In keeping with recent tradition, the Secret Service will place a brand-new presidential limousine into service January 20 to drive the new president on the 2-mile jaunt down Pennsylvania Avenue during the inaugural parade. "Ugly as sin," says one car enthusiast on an auto Web site. "Can't we make a hotter ride for our pres?" "Sheesh," says another, "why don't they just transport the president around in an Abrams tank." One news agency, noting its 8-inch-thick doors, says the limo can withstand a "direct hit from an asteroid." But GM spokeswoman Joanne K. Krell laughed off the comments. In truth, the new presidential limo is a Cadillac, Krell said, although it is "not a direct extension of any single model." "The presidential vehicle is built to precise and special specifications, undergoes extreme testing and development, and also incorporates many of the top aspects of Cadillac's 'regular' cars -- such as signature design, hand-cut-and-sewn interiors, etc.," Krell told CNN. "Cadillac is honored to serve and renew this great tradition," she said. "And it is entirely appropriate that an American president has at his service a great American vehicle." For much of the country's history, the Secret Service didn't even drive the president, evidently oblivious to the dangers of asteroids. In the post-Lincoln horse-and-buggy era, it was customary for a security detail to closely trail the president, according to a Secret Service history. With the advent of automobiles, the Secret Service acquired a 1907 H. White Steamer to follow Theodore Roosevelt's horse-drawn carriage. White House chauffeurs drove later presidents, until the Secret Service assumed many of the driving responsibilities after Franklin Roosevelt's death in 1945. "I think he will be surprised about how when he's in the limo, it's a cocoon," Funk said. "The everyday noises will be gone, and he will be totally isolated in this protective envelope." "At the same time, I think he will be surprised at the communication capabilities, how the phones, the satellites, the Internet -- everything is at his fingertips," he said. "So at one end, you are totally removed from society. The other side of the coin is that he can have any communications worldwide at a moment's touch." Funk says presidents sometimes chat with the agents, and sometimes don't. "Every day is different, just like every person," he said. "Sometimes they get in the car and they have a lot on their mind. They're involved in reading material, they're involved in the newspaper, they're talking to local dignitaries or they are talking to Cabinet-level. "Other times, they are interested in sporting events, in doing the crossword puzzle, interested in the feedback they get from talking to the agents -- primarily the supervisor that sits in the front seat," Funk said. While the government spares no expense for the presidential limo, the weight of the car makes it less maneuverable and more sluggish than comparable sport utility vehicles, Funk said. And the door and window frames, which accommodate thick ballistic glass, create large blind spots, he said. Funk's own experience driving Clinton was uneventful, he says, which is a good thing, considering his line of business. "I was very lucky. We didn't have any close calls," he says. "Everything was very smooth." But he still considers the experience a career highlight. "At the end of the day, if you had a good driving day, you do kind of sit back with a certain amount of pride and say, 'I had the president of the United States in the car with me for an hour, two hours, and I got him from point A to point B safely in conjunction with all the other team members,' " he said. "When it's done, you can sit back and take some pride in knowing that you pulled it off." One Internet wag, adding to the rampant speculation about the new car, made this prediction: It will be painted black. But environmentalists may ask, will it be green? Not likely. Car enthusiasts believe the overweight vehicle burns diesel and will have low mileage. And with diesel costing about $2.40 a gallon Monday, versus $1.67 for gasoline, this new limo can't be called an economy vehicle. "The limousines of yesteryear were designed just well enough to provide protection to get the president out of the situation," says Ken Lucci, CEO of Ambassador Limousine Inc. and owner of two Reagan-era limos. "In today's case, they [the Secret Service] expect a prolonged attack, and they expect an attack that is a lot more violent than [with] a weapon you can hold in you hand." "It literally is a rolling bunker," he says. "It just happens to have wheels on it." And it's not a bad vehicle for someone whose job is to fix the economy, even if it won't brew coffee on command.